"Hello, Manchester. I'm sorry I'm late!" Before the con started, the MC laid down a number of rules, one of which was that there were to be no questions about slash fiction. This came specifically from the guests, who had asked that this topic be off-limits and was repeated before Peter came on. Work it out for yourselves, folks. Thankfully, everyone respected that and no guest was embarrassed in the same way that Valentine was the year before. Peter bounded onto the stage, grabbed the microphone and said “Hello, Manchester, I’m sorry I’m late”. Perhaps we should have told him...... After a request for him to do cute - which he claimed was so long ago he couldn’t remember how - we started with a question about Modern Prometheus, which confused Methos and Duncan with Peter and Adrian. Peter said he and Adrian had very similar ideas the story they were telling in Modern Prometheus. Adrian had wanted the flashbacks to be lush, with the present day scenes jagged like a rock video, an approach Peter had found interesting. He said it was easier to play the antagonism between Methos and Duncan, as he had been fearful of the relationship between them becoming too pally, which would have taken away the edge that he felt was important to maintain. He said he felt that, when Adrian directs, his acting suffers a lot, as he looks at the overview and doesn't concentrate on being Duncan in the way that he normally does. Peter said that, in those episodes, it was like Adrian wasn’t completely there when he was acting opposite him. He compared this with Clint Eastwood in Unforgiven, where he felt that the actor suffered at the expense of the director. Peter was in three of the four episodes that Adrian directed and said that he liked working with him as a director. He also said he liked working in radio, as he never had to learn any lines! Questioned about Methos’ motives in Revelation 6:8, Peter compared him with Hamlet. In the play, you are not quite sure if Hamlet is crazy or not and he felt that it was the same with Methos. He starts out just trying to survive and slowly loses his grip on reality. By the end, Methos is just about hanging in and, whoever triumphs, you can believe he’s going with the winner. Peter felt the challenge to Silas over Cassandra came from his heart, but if Kronos had defeated Duncan, Methos would have sided with him. Peter said he liked the way that Methos’ clothes seemed to fall apart in Comes A Horseman just as his world started to do the same. He compared the sweater he was wearing during the dock scene at the end of Horseman as being not so much a sweater as a straitjacket. Someone mentioned the HL blooper tape, which features him tap dancing between scenes. He looked blank, as clearly he doesn’t remember this, but said he wasn’t surprised, as he has found that he can speak French, German, Cantonese and several other languages by watching himself on Highlander. Asked about whether Methos was a good guy or a bad guy, he said that it was more fun to play the baddie. Directors often have a personal view of what the good guy should be like and they’re not alone. He knew that there had been a great debate in the first season of Highlander about Adrian’s earring and whether or not he should have stubble. For the last two years, he has not been playing the bad guy, just characters who were a little tough. He said you couldn’t think of your character as a baddie, as that led to cliché acting. He added that he felt that Methos was neither good nor bad. The next day, he said pretty much the same about period acting. Directors try to make actors behave as they assume people in those costumes behaved and it stifled the acting if you were expected to be a period and not a character. He had finished filming Strange World on Thursday, although they had had the Wrap Party the previous weekend. He was told that the Strange World website had only had a handful of hits, but within an hour of his being cast, there were 3,000 hits and they have maintained that level on a daily basis. Howard Gordon, the producer, said he had never known anything like it. They have made 13 episodes, which will start screening next week in the US next week, in the NYPD Blue slot on 8/9 March. If the response is very good, it will be pulled after six weeks so that they can make a full season’s worth of episodes and rerun the whole thing in the autumn. Peter doesn't appear until episode 9 or 10 and his character... well, I’ll put the spoilers at the end, right? Peter said that he doesn't get work in the UK these days as there is a perception that he works in the US all the time. Asked if he would be in Highlander 4, Peter said it’s not that simple. Although Cristoph and Adrian have been under contract, (and paid! ), since last March, it was Miramax who were making the film and Bill Panzer’s wish to draw characters from the TV series into the films may not be welcomed by them. The script had to satisfy Davis Panzer, as the owners of Highlander and Miramax, as the financiers. David Abramowitz had written a script, as had Gregory Widen, but Peter felt a decision had to be reached soon, as the contracts with Adrian and Cristoph expired in May if no firm date for shooting was set. Asked about The Raven, he said he had talked with Don Paonessa, Bill Panzer and Elizabeth Gracen. The problems with the series lay in the origins of the finance. Highlander was 70% Canadian funded, with 30% coming from Europe, whereas for Raven it’s the other way round. The French and German companies hadn’t wanted anyone from Highlander and had wanted to make Moonlighting. However, the series had become more like Highlander as it had progressed, but they were uncertain if there would be a second season. They had wanted to string the tease between Amanda and Nick over a five season arc, but they felt that it wasn’t working. Talking of his various TV roles in the UK, he said he had been surprised when he had been replaced on Medics by a different actor after he decided to leave, especially as he was shot in the final episode he appeared in. He watched the first episode of the new season only to find “his” girlfriend with another bloke, acting for all the world like he hadn’t died - and then he found out he hadn’t! He said that he occasionally gets a royalty cheque from his time with Soldier, Soldier, but only about £20, enough, as he put it, for a Balti, (which is a type of curry, for those unfamiliar with Indian cuisine). As for Noah’s Ark - he left after the first season after a major falling out with the producers. He had complained about the bad treatment of the crew and the cast. What happened, (and he said this is becoming more common), is that the writer pitched the idea to the network, who put the production out to tender, with the production company that puts in the lowest bid getting the show. They put in bids that they know are less than it will cost to make the show, then rely on goodwill from the cast and crew to make it happen. Suddenly, the five day week in your contract becomes a six day shoot and, because overtime is “bought out”, you’re doing it for free. Peter said he views his fee as for the episode, no matter if it’s over five or six days, but he felt for the crew, who don’t get paid what actors get paid and are on an hourly rate. This niggled with him and he had rows about contract details. He felt the first episode of Noah’s Ark was terrific and that a couple of others were good, but felt that it could easily have degenerated into him and Anton Rodgers having to row each week on screen as Noah and Tom had yet another disagreement before it all worked out in the end. Asked which of the haircuts that Methos had was his favourite, he said the Blue Face one was “pretty hot” and that it had been a shock, as he has never had long hair. He didn't like the look in Modern Prometheus and felt that the short hair version would be his look of choice. Peter appeared in a film called Uncovered early in his career and said that he had enjoyed working in Barcelona for three months. He had been amazed at the local weekend - party all night Friday, spend Saturday on the beach, clubbing until dawn, then recover in time to go to work on Monday. He said he couldn’t have managed more than three months of that. He had worked with Tom Baker on that film and said that Tom was barking mad. (During this, we kind of lost the plot, as proceedings were disrupted by Valentine Pelka hamming it up round the door to the green room, peering round, then reaching behind the door and yanking his own hair as if someone unseen were dragging him away.) Apparently, Tom Baker was so upset with the wines in the restaurant that he would take his own wine with him and insist on it being served to him, loudly proclaiming that the house wines were inferior. Peter said Tom had very good wines and was very generous with them. Peter will be running in the London Marathon in April and completed a half marathon in Vancouver two weeks ago. Asked about the Horsemen’s horse, he said that Val loved his horse, Marcus had the beast from hell and that he had approached his with respect, on the basis that if he was nice to the horse, it would be nice to him. He had never ridden before and smiled when he got the script, as they would have to teach him to ride. Normally, he would never have got a chance at a role that required riding, but they were kind of stuck with him! Asked about whether he would like to play a historical Welsh character, he said it would be nice to act in Wales again, although he had learnt Welsh at school, but had forgotten most of it. He said at one stage he had talked with Bill Panzer about a Methos Chronicles, (my title) series. 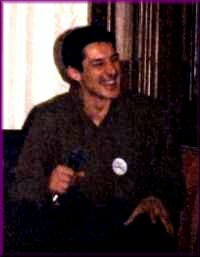 They accepted that Season 6 was a transition and they felt that there was the most prospect in a series featuring Joe and Methos. Adrian was exhausted and wanted out, so to avoid that happening to someone else, they had discussed an anthology series, with perhaps Methos telling Joe about an Immortal, which would enable single episode characters to make sense. But the buyers had wanted a girl led show and that was that, as time passed by and the moment was lost. Peter said he felt that the networks didn’t respect the fan base and that he felt it was insulting to the fans to have Valentine play another character in Raven when he was so well known for Kronos. He quoted that when Cold Squad cast him, it raised their ratings by 2 to 3 percentage points, which demonstrates the Highlander fan base. Peter said that he was always searching for a sense of the new, which became more difficult. He spoke of an actor he worked with in his last play, who was improvising new stage business right up to the matinee on the last day of their run. He had found improvisation terrifying at drama school and even now it made his blood run cold. By contrast, he had been disappointed by his departure from The Archers. He had believed that Simon Pemberton would be killed, but in the end he just drove off. He said that the Cold Squad production office were freaked out when fan mail started arriving for him. They hadn’t had much fan mail at that point and had to look to see who this Peter Wingfield guy was. Then they found him on the cast list - but for episodes hadn’t been filmed yet, let alone broadcast! Someone asked about the leather necklace he wore in Chivalry and Timeless. At a convention in Denver before those episodes, the PWFC was born and Linda Wyatt had sent Peter a stone from beside a lake in Ithaca, New York. He liked the idea of Methos wearing something so old and so took it with him to Vancouver, but it didn’t work, (he said it just looked like you could see his radio mike), but he kept the leather thong for a while before abandoning that. He said that he felt Alexa had had strength in heart and an honesty, which was what both attracted Methos and turned him back into a gawky teenager. Asked if he felt stupid doing a Quickening, he said the answer was definitely yes. Doing the blue screen shots for Revelation 6:8, he felt pretty silly, but then Adrian hadn’t looked too clever braced backwards on a stool for the blue screen shot for Caspian’s Quickening, as Duncan is supposed to be falling into the river. He said that he, Adrian, Elizabeth and Stan had taken themselves off to Italy during a winter break in filming, touring in a small car. They had stayed at San Geminiano (sp?) and Sienna. They went to see the sites, shop and have great meals. They had knew they had ordered some serious wine with their meal when the waiter brought a candle to the table for them to inspect the wine. According to Peter, Adrian made like he knew what he was doing, the rest of them just drank it! The Double Quickening from Revelation 6:8 took about three days to film, in different places. For the shots in the submarine base itself, they had a boat with one crew in and two other cameras ashore. Peter said it took a day to wire up the explosives and as the explosions underwater started to get nearer to him, he was thinking, “one more of those and single take or not, I’m outta here!”. Of the Quickening in Indiscretions, he was so focused on where he was - stood on top of a metal disk the size of a dinner plate over a smoke machine, with a 30’ drop below, that he failed to notice the huge flame jets that went off behind him. Because of the camera angle, you can’t actually see them in the episode. As it was the last shot of the last episode, all the producers were there and kept asking him if it was hot and he had no idea what they were talking about! He said it was incredibly satisfying to be an actor, but it can also be very lonely - the rejection is personal, “we don't want YOU”. You can’t be rubbish, but you can’t be afraid to be bad, as everyone has at least one turkey in their past. Asked what he might have done otherwise, he said that the urge to return to medicine came every time he watched ER, but he knew that he couldn’t give the total commitment to medicine that he would demand of himself if he were to go back. He said that acting takes you to places you might not want to go in real life and that, through Methos, he’d gone to some of these places, to the pain in Methuselah’s Gift, the darkness in Comes A Horseman - an actor could go there, look over the edge of the abyss and return, because it wasn’t real. Methos has been a gift to him as an actor because the role has been so varied. Peter said he had been playing his character Shephard based on what was in the scripts and in the brief that he had been given, but that it was all lies. He turns out to be the baddest of bad guys in the last episode and that all the other characters die, or you’re led to believe they die, leaving him as the last one standing.